Every now and then a game pops up where, by the title alone, you feel like it’s something that you need to check out. Something about the title draws you in, and sometimes you can’t even put your finger on what it is. In this case, the game was called Badass Hero. I really don’t think I need to explain why that title drew me in. 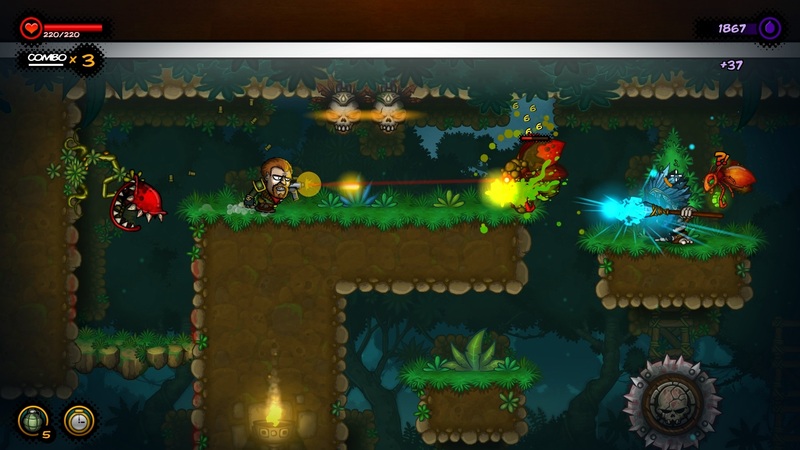 Badass Hero is a “roguelite” platform shooter where the the player is a character in a comic book. Each area of the game is one page of the comic book, and the goal is to get from the top left of the page down to the bottom right. The pages are procedurally generated, and change whenever your character dies, creating a sort of permadeath. However, by killing enemies, the player gains ink which can be used to upgrade their character’s abilities. You keep ink and upgrades on death, so in dying over and over you make gradual progress towards the boss every few pages, which serve as checkpoints for progression. 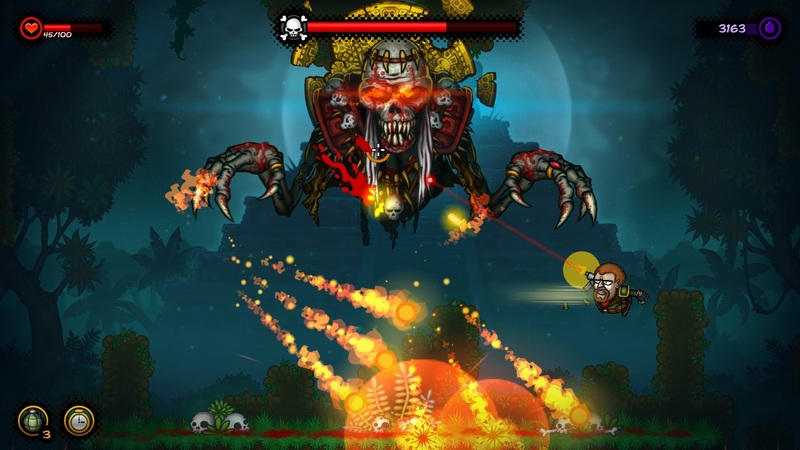 Gameplay is based on running, dashing, jumping and shooting, with the added ability to stomp down on enemies directly below you for high damage. You can aim freely in 360 degrees, with a wide variety of different weapons available with different traits and strengths. Each new page is more challenging than the last, with new and stronger enemies, but the progression system allows the player to make steady progress even if they aren’t particularly good at 2D platform shooters. Characters are also fully customizable, in terms of abilities, armaments and appearance. The aesthetic design is specifically designed to reflect the comic book setting. 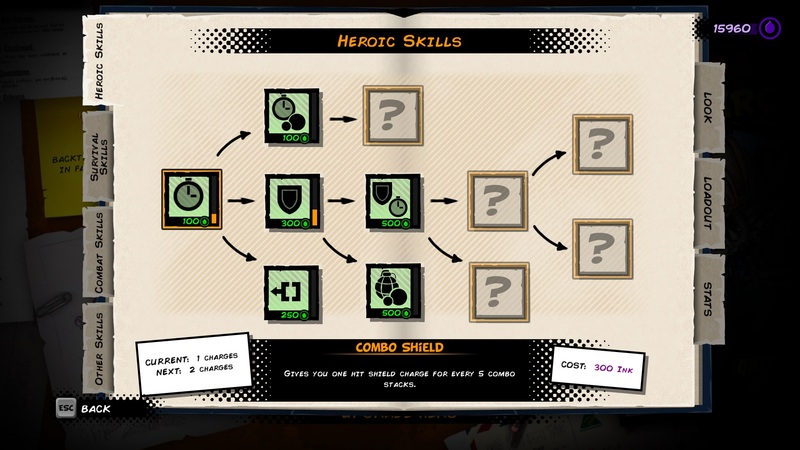 The player character and enemies are done up in a comic book-esque art style, with new items presented in the world as floating comic book panels. Blood splatters everywhere as you shoot enemies, which themselves often stand out against the background with bright colors and glowing lights. The entire aesthetic looks quite nice in motion, and does a great job of furthering the feel that Polish developer Awesome Games Studio is trying to create with Badass Hero. For someone not used to playing platform shooters with a full range of aiming, it takes some getting used to – I never felt really at home with the game in my whole demo session. However, it seems like it would feel great to play well, and to be able to jump and dash between enemies competently. We’ll be able to have that chance when the game releases on Steam, PS4 and Xbox One in the second half of 2017.